Kudos to Carolyn for telling the dealers to stuff it where the sol don’t shine. For more Carolyn, visit her at www.thetravelwench.com; for more Jackie’s, visit her Facebook page and make a friend! If you are a drug dealer and you are thinking of visiting Mexico, watch out! It can be very dangerous. 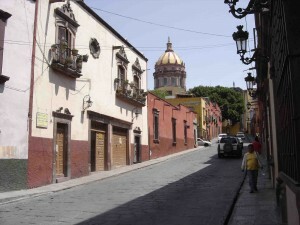 If you are a tourist/traveler in search of an experience that includes delicious food, warm and welcoming people, glorious art, spicy music, centuries-old architecture and modern bus transport all over the country, well, smart money will have you booking a trip to the heart of Mexico today. And, as a not-inconsiderable bonus, you will be taking advantage of truly bargain prices – all because the drug dealers who are bumping one another off in the border towns have gotten 99% of the international press. True. Google Mexico and you’ll find dozens of stories, virtually all of them negative. This is a view of Jackie's San Antonio. Yes, this picture is worth a thousand words. We were discussing this at dinner last night in Jackie’s San Antonio, one of San Miguel de Allende’s most upscale restaurants. The evening was cool after a brief downpour that made the streets and the lush garden glisten. Across the street, the church of San Antonio was glowing in the early evening sun and farther down towards Centro, the glorious Parroquia cathedral looked freshly gilded. The table included a coup le from San Francisco who have been coming here for years and another San Francisco couple making their first trip. The “old-timers” were relaxing on this visit, as they’d spent the better part of a year remodeling and furnishing a beautiful home not far from the restaurant. I’d met the newcomers shortly after they arrived, three days before, and in that short time they seemed to have grown a few years younger. They had discovered San Miguel time, a luxurious place where we walk everywhere, sit for hours with friends over meals and coffee, and do our shopping in tidy little tiendas where we know the owners. Some of us have cars, but we don’t really need them because the taxis are so cheap. For a trip to Guanajuato or Queretaro, both of which I made this last week, first choice is the immaculate Primera Plus bus line, with plush seats, air conditioning and top movies. It’s cheap and always on time. 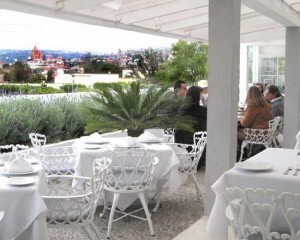 The four San Francisco friends are in Guanajuato today, staying at a boutique B&B in the best residential section. When they booked, they had their choice of rooms at a discounted rate. That is unusual, because July is traditionally the start of the “second high season” here, the time when visitors from the U.S. border states come for a break from the heat. 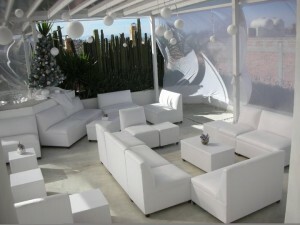 But, bookings are not materializing and the restaurants and hotels are beginning to suffer. Jackie told us that she is worried about keeping her highly trained staff if the usual tourist flow doesn’t materialize. “When you start using your broom to clean, of course there is some dirt that’s going to be stirred up,” is how she put it when we talked about the Calderon drug war. Nobody here wants that war to ease up. But the media’s focus on that to the exclusion of the rest of Mexico is making the economy take a big hit. Can you imagine yourself here? I can. I did. I was there. We missed you! So what can we do? Those of us at the table decided to do what we would normally do, and then take it up a notch. The ones who checked TripAdvisor before coming down are now posting their reviews of different Mexican destinations, restaurants and hotels on that site. I’m writing a blog post. 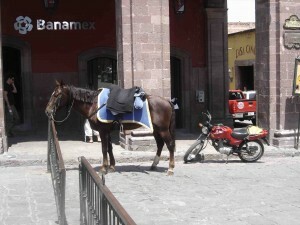 Transportation choices in San Miguel. Being in a hurry isn't high on anyone's list, whew! A view of my (very quiet) street. I could not agree more with you, Carolyn. The lifestyle here is perfecto and this city, San Miguel de Allende offers so much to tourists and those who decide to live here for a longer time. I am so glad that we have a year here to enjoy Mexico.